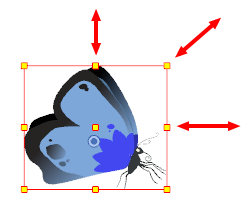 You can scale a layer from its pivot using the Transform tool. You can temporarily reposition the pivot to scale from a different point. Click an drag the top, side or corner control point. NOTEWhen scaling your selection, you can hold down Shift to preserve the proportions between its width and height.